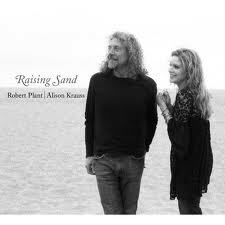 A one-off collaboration from 2007 between Robert Plant and Alison Krauss, Raising Sand was deservedly successful, winning a clutch of Grammy Awards. Although Mr Plant is unlikely to return to the level of success he enjoyed with Led Zeppelin, this shows that he continues to be an imposing presence and an interesting artist to follow because of his readiness to try new things. On this he really sounds like he’s enjoying himself! Ms Krauss is also an established and successful artist – but in a more specialist genre, bluegrass, and this project gave her a strong platform from which to appeal to newer and wider audiences – both as a vocalist and as a fiddler. What makes the project fly though, is the presence in the producer’s chair, of the quietly brilliant T-Bone Burnett – who also contributes some tasteful guitar work. What Mr Burnett really brought to the project though, was his ‘curatorial’ selection of the thirteen tracks that make up this collection and the way he blends and sequences them together. 1. ‘Rich Woman’ by Dorothy LaBostrie (who wrote’ Tutti Frutti’ for Little Richard) and McKinley Millet. Originally recorded by Lil’ Millet [presumably the aforesaid McKinley] and his Creoles. Only after hearing this a couple of times did I realise that I knew the original version from an undistinguished compilation. 2. ‘Killing the Blues’ by Roley Salley which was more familiar since it was included by Shawn Colvin on her 1994 Cover Girl album. 3. ‘Sister Rosetta Goes Before Us’ by Sam Phillips was a new song for me, presumably about gospel singer Rosetta Tharpe. 4. ‘Polly’ [Come Home] by Gene Clark, formerly of The Byrds and of Dillard and Clark (from whose 1969 album this comes). 6. ‘Through the Morning, Through the Night’ is another from the pen of the late Gene Clark – and from the same Dillard and Clark album – thus almost ensuring it a healthy sales boost as anoraks like me go back to check the originals). 7. ‘Please Read the Letter” by Mr Plant and Jimmy Page along with collaborators Charlie Jones and Michael Lee. This appeared on Page and Plant’s 1998 Walking into Clarksdale album and benefits here from Alison Krauss’s vocals. 8. ‘Trampled Rose’ I wasn’t familiar with this song but certainly knew the co-composer Tom Waits. 9.’Fortune Teller’ , credited to Naomi Neville (apparently a pseudonym for Allen Toussaint) and recorded by The Who (on Live at Leeds) and The Rolling Stones. 12. ‘Let Your Loss Be Your Lesson” – another song and composer with which I wasn’t familiar – and still haven’t followed up. A quick search in writing this post suggests that composer Milton Campbell was a jobbing delta blues musician who enjoyed modest success as Little Milton. Happy to learn more about him. 13. ‘Your Long Journey’ by Doc Watson andhis wife Rosa Lee Watson is a lovely way to end the album. I know Emmylou Harris has recorded this – but I first heard it performed by Rory Block and Lee Berg on something called Woodstock Mountains: More Music from Mud Acres (another ‘project’ involving John Sebastian and Happy Traum and Artie Traum from 1977 which in many ways sounds as if I could have been a progenitor to Raising Sand, having a similar sort of sound. I expect these notes explain why I like Raising Sand: Great performers and a mixture of new and familiar songs pulled together in a way that invite the listener to go back to source and develop their musical understanding, enjoyment and knowledge. If only someone could pull off a UK version which had a similar impact! I picked up this 1986 Tom Waits compilation (plus a bunch of others) for just £1.99 a pop when the Our Price music chain closed down in the early 2000’s. It was cheap because it lacked its jewel case and inlays – just in the shop’s cardboard sleeve. It’s a collection of 14 tracks taken from Mr Waits’ recordings for the Asylum label between 1973 and 1980 and I like it – although I’ve never been tempted to go and see him in concert. I always enjoyed his lyically rich performances when he appeared on Whistle Test and other TV or when they were heard on radio – but the overall persona and world is so distinctively American. It’s a retro feel, inspired by Edward Hopper’s 1942 painting Nighthawks (indeed Waits’ live album from 1975 was called ‘Nighthawks at the Diner’). This is a slightly exotic, film-noir, urban world without sunlight, reeking of bourbon and cigar smoke and inhabited by lonely, transient romantics trying to convince themselves and others that they ‘coulda been a contender’ over the sound of a jazz piano! This is an interesting landscape to visit once in a while as a tourist but a bit too far from my life in the UK to inhabit for long with any conviction! Still, it’s a showcase for Tom Waits’ distinctive gravelly growl and fine songwriting skills of which my favourites are ‘Small Change’ (probably the song that introduced me to to him), ‘Grapefruit Moon’, ‘Martha’ and ‘Tom Traubert’s Blues. In addition there’s a great duet (I Never Talk To Strangers’) with Bette Midler and a remarkably effective take of the Leonard Bernstein/Stephen Sondheim song ‘Somewhere’ from West Side Story. 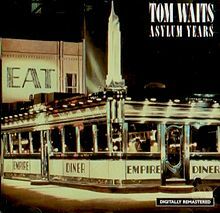 It’s the only Tom Waits album in my collection – but I’m open to suggestions for what to try next.